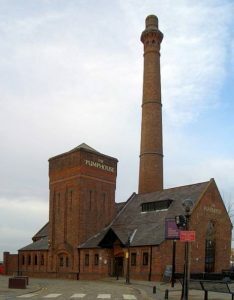 Victorian Industrial Architecture: The term Industrial Architecture refers to the design and pattern with which the industrial building was constructed. The significance for specially designed industrial structures came to the forefront during the era of Industrial Revolution. The word “Industry” includes within its ambit factories, mills, distillery, warehouses, breweries, etc. This article discusses the evolution of Victorian Industrial Architecture. For easy understanding, the article has been divided into two periods- Pre Industrial Revolution and Post Industrial Revolution. The industries during the Pre Industrial Revolution period were completely opposite and primitive in nature in comparison to the ones that came up after the Revolution. In fact, the concept of the industry as we know it today did not really exist. However, some basic features of an industrial set up like chimneys and windows remain the same. Earlier, the industrial buildings were constructed using simple and easily available materials. These materials were used on a large scale and they included limestone, stone, bricks, and wood. These materials were then mixed with soil. This combination of mixing the building material with soil helped in holding the structure together. During this period, the industries were much smaller in size than their Post Industrial Revolution counterparts. The height and weight of these smaller industrial units varied depending on the holding capacity of the building materials. Having said this, there was by default a limitation as to how much burden the industrial structure could bear, both horizontally and vertically. Chimney was another regular part of the industrial architecture. The chimneys were built of stone or bricks as to guide the smoke out of the industry and de-clog the premises from remnants of any harmful pollutants. The chimneys were also small, built in a way to suit the size of the industrial unit. Although there were windows in the structures, they were small and this resulted in less supply of air. Industries during the Pre Revolution era were functional either in the worker’s home or in small shops. Manufacture of products was made possible by using simple machinery or hand tools. The birthplace of Industrial Architecture was England. Industrial Architecture came in vogue during the 18th century. This expansion of architecture in industrial structures was a product of the Industrial Revolution. 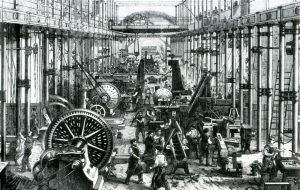 This Industrial Revolution took place on a large scale in the initial few years of the 18th century and had a long-lasting impact on several aspects, social as well as commercial. The Industrial Revolution paved the way for the construction of a new type of materials for building industries. There was an increase in the production and usage of materials like steel and iron. These materials were being used on a wide scale as frameworks to the industrial buildings. Although different building materials were now being used, bricks still remained at top of the list as the principal building material with iron or cast-iron being used as the framework. With the advent of some break-through innovations that were a result of various scientific experiments and research, the scattered manufacture of products from either individual house or shop was brought under one big industrial unit. It was from these big industrial premises that raw and unfinished goods were now transformed into finished products. Also, sturdy structures enabled usage of heavy machinery. 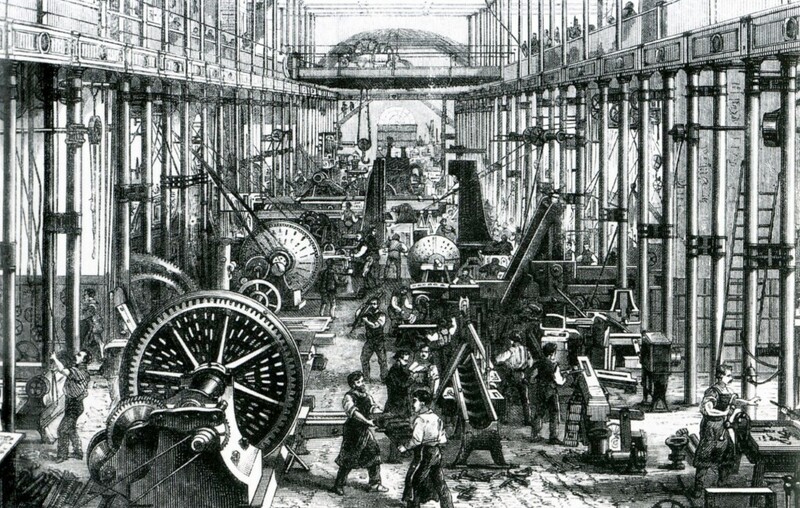 This new type of machinery helped in increasing the production of the goods. During this period, the production of cast-iron as an industrial building material reached new heights. Along with cast-iron, granite had become the newest material for building industries. Over the years, it had gradually become known to the engineers and architects that granite does not catch fire. This was an important discovery in the field of architecture since wood (that was primarily used to build structures) would easy succumb to fire and it resulted in a massive loss to the goods and property. Innovations had made it possible for the discovery of newer materials apart from cast-iron like wrought iron, steel, etc. These were lighter in weight, sturdier than previously used materials for building. An important feature of these newly found materials was that they bore resistance to any type of structural tension. This, in turn, enhanced the capacity of the structure to be expanded not only with regard to its weight, but also the height of the new age industries could be increased. Another new invention during this period was the production and use of glass. Glassed windows had become a fashion. These windows were bigger in size than the ones built during the Pre Revolution period. The increased size of the windows enabled a good supply of natural light. The Post Industrial Revolution era saw the incorporation of different architectural styles. Doric order style was being used while constructing pillars for some industries. Doric order is a Greek architectural style. Doric columns were simple architectural design. The columns or pillars were very thick in order to support the weight of the structure or ceiling. Above these columns were smooth-surfaced capitals or round shaped structure. In some of the earlier designs, a square-shaped structure would be placed in between the capital and the column. This ensured the longevity of the entire structure. Apart from Doric columns, pilasters and pediments were commonly used for providing support to the building. Some factories during this period were also built in Classical style. 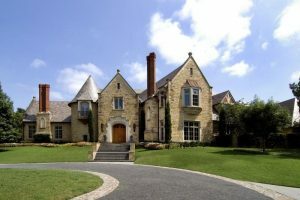 Another commonly seen architectural style was Gothic with its signature pointed arches and windows. This period also witnessed experimentation of architectural styles. It was achieved by merging two architectural designs and creating a new one. For example, the combination of stones and bricks, or even two different colored bricks were used. Gothic style industrial buildings were built using stones. Thus, it can be rightly concluded that the entire transformation of the industries, from being run from the backyard of the worker’s house or small shops to being brought together under one roof in form of large industrial units. All of this was the resultant of the Industrial Revolution. The Revolution that took place over two centuries ago is primarily responsible for bringing out the notion of Industrial Architecture. It was this architectural venture that had laid the foundations of modern-day structural architecture.